American Dream Cars, Leicester limousine hire aim is to provide the biggest and best American limousines of the highest standard for that really special occasion. These are THE cars to be seen in !! Our company is well established and has been trading for many years and have a range of beautiful cars and limousines to choose from. 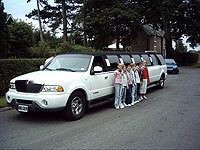 Best for limo hire Leicester. Chill Out need a limo to take you to open the new shopping center??? ?, perhaps your next PR shoot or the latest film festival. 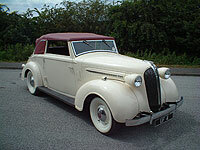 Then American dream cars have the answer in chauffer driven comfort, sit back, relax and arrive ready to go. Let us get you there in style and stress free. H2 Hummer Limo Limousine Hire,(This is now sold) travel in style with Hummer limo hire Leicester services. 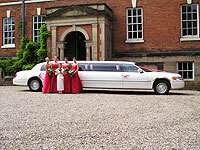 This limo is a sure head turner in Leicester, Nottingham, Derby and Surrounding areas. Hire this stunning H2 Hummer Limo for your special occasion or day out. Don't limit yourself ... jump in and let us take you for the ride of your life. Perfect for weddings, proms, group transportation to concerts and sporting events, hen nights, stag parties, corporate events, Royal Ascot Racings. Leicester limousine hire for all your chauffeur driven limo hire needs in and around the Leicester area. We cover the whole of the UK and cater for special occasions such as Weddings, Birthdays, Hen and Stag nights. Days out at the races such as Ascot, Doncaster and Cheltenham. Our Luxury Limousines are equipped with exceptional extras to make your journey more pleasurable, which include air conditioning, full leather interiors, CD and TV video systems. Our Limos feature privacy dividers, intercom to driver and full neon and mood lighting. 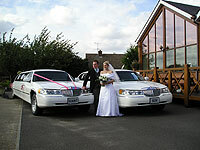 Leicester Wedding car hire are a great way to start off married life, arrive in luxury comfort and pure style. Then after the reception our wedding limousine will be there to take you to your hotel or airport for that all important honeymoon. 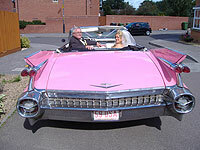 Wedding car hire from American Dream Cars. 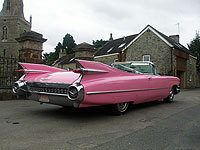 Pink Cadillac, a classic car is an ideal car for all you Rock 'n' Rollers, what a great way to arrive in style at a theme party. 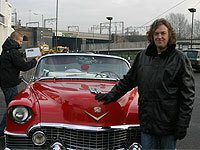 Red Cadillac classic car is another of our Rock 'n' Roll era classic cars, a great way for all you jive bunnies out there to arrive at the party in style. Maybe even your own Rock 'n' Roll theme Wedding. New York Checker Taxi cab Limousine (this is now sold) is one of our more fun limousines to hire, it features a bar and music system to put any music fans in the mood for a great start to your night out. 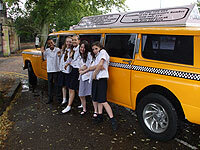 It is the only New York checker taxi cab limousine in Leicester. 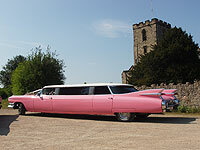 Limousine hire, come to American Dream Cars to hire from our range of limousines and classic cars. We cover the whole of the midlands area Loughborough, Derby, Nottingham, Burton on Trent, and Birmingham. Our services include school proms, and special occasion events. 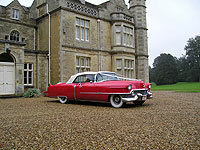 We have special set prices for white weddings and civil ceremonies for each of our limousines and classic American cars. Hummer . 4 x 4 . Navigator . Lincoln town car . 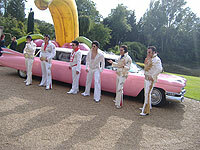 Pink Cadillac limousine . New York yellow checker cab limousine all available and chauffeur driven.